Photo details: Canon 100mm macro lens on Canon EOS 50D (manual mode), ISO-100, 1/250 sec, f/13, MT-24EX flash 1/4 power through diffuser caps. This entry was posted in Apidae, Asilidae, Diptera, Hymenoptera and tagged bees, entomology, flies, glades, insects, Missouri, nature, Ozarks, predation, robber flies, science. Bookmark the permalink. Great shot! I love these critters. I think we have half a dozen or so Promachus species in Texas, but this is the one I see most. And they’re quite brave: they have no problem going after hummingbirds, let alone anything else that moves. Thanks, Jason – these guys are quite photogenic. I seem to encounter a lot of robbers in the same habitats that my beloved tigers frequent. They’ll even nab one every now and then (the predator, thus, becomes the prey). Absolutely BEAUTIFUL! Great shot Ted. I love flies, they are one of my favorites to photograph, their eyes are wonderful! I love this little guys “Papa Smurf” mustache. Thank you, Shelly. These guys are impressive enough, but the “beards” make them all the more stunning in these closeup photos. Ditto the great photo. I liked this post a lot. Nice work and thanks for the information. The False Gaura has only been reported in two counties along the southern border of Missouri. If you find one elsewhere, report it to the USDA Plant Database. Here’s a link to the southern region of Missouri with some very interesting information, the White River Hills region is included: Ozark Region. Let me know if you find this of any interest. Hi Troy – thanks, and it’s my pleasure. Very nice article on the Ozarks. It’s hard to choose what part of Missouri I like most, but the White River Hills have to be right up there near the top of the list alongside the St. Francois Mountains. In your neck of the woods, the “Hill Country” stretching from Austin down to San Antonio and west to Uvalde reminds me so much of the Ozark Highlands. I’ve done quite a bit of bug collecting there – great stuff! Great shots! 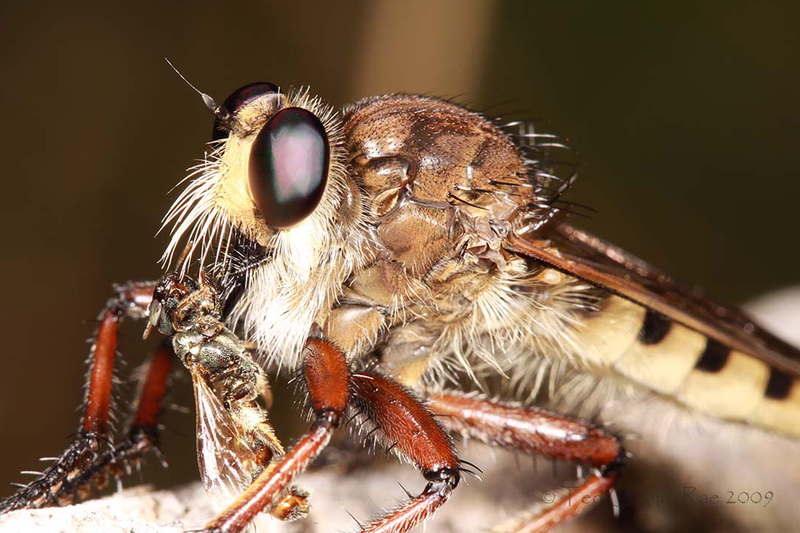 I’ve just recently discovered robber flies and they truly are cool bugs. This photo left us breathless. You’ve done amazing things with your camera — that macros lens is serving you well! We especially appreciate it when moments of ‘drama’ like this can be captured. Way to take us right into the insect world! Thanks, K&R. I’m having a lot of fun with the camera – it has certainly breathed new life into my bugging activities this year! This robbery fly certainly has huge eyeballs! Stunning photography! Just how do you do it? PS Have you heard from Chuck Bellamy lately? Hi Trevor – thanks! Lighting is the key. I use a twin flash unit – the multidirectionality of the light prevents sharp shadows, but it is a more lively lighting than a traditional ring flash. Other than that, just make sure you get the eye in focus. Chuck and I chat frequently – he seems to be getting around pretty well these days, as he recently returned from a collecting trip to northern Mexico.